With a new Israeli-Palestinian round of negotiations off to another wobbly start, there are few, if any, optimistic prognoses from anyone involved. Simultaneously, there appears to be an overabundance of warnings about what might likely scuttle the process. This in itself is telling, especially when the nature of the profuse admonitions is examined. While purportedly assuming the role of an honest-broker, the US unhesitatingly rushed to side with the PA position. Behaving more like an adjudicating overseer rather than a non-interventionist mediator, American Secretary of State John Kerry pronounced all so-called settlements as inherently illegitimate (this includes entire extensive veteran neighborhoods of Jerusalem). Moreover, Kerry has reportedly threatened Prime Minister Binyamin Netanyahu with “delegitimization on steroids” should the talks flounder. The subtext is that unless Israel surrenders increasingly more ground, it will become a pariah. All the onus is incontrovertibly on Israel. Suffice it to say that Israel’s complaint has received zero resonance not only in the international media but also from Kerry and his team. Netanyahu’s words were studiously ignored. But are they indeed unimportant? They shouldn’t be if Israel is viewed a priori as a negotiating partner rather than as a scoundrel state to be pressured and squeezed into submission. Hate propaganda should be prohibited in the context of any quest for peace. Where incitement is at all tolerated, it may be argued that peaceful intentions are dubious. But, as in the PA’s case, where incitement is the pet project of the authorities, it amounts to a gross violation of any and every undertaking to pursue any mode of coexistence. In the PA incitement is omnipresent and actively nurtured by officialdom via its controlled media, the school system it operates and in the mosques whose clerics it appoints and sustains. Numerous daily reports by the Palestinian Media Watch more than amply illustrate this. Calls for what amounts to genocide and ethnic cleansing against Jews proliferate without offending any State Department sensibilities or generating the slightest indignation in overseas media. Palestinian daily denial of any Jewish connection to this land and right to exist here is serially overlooked. 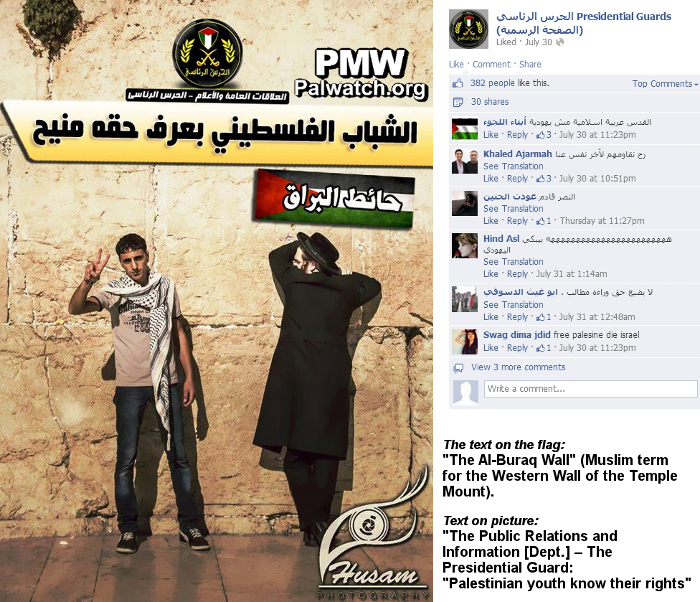 Just last week, the PMW informed all and sundry that the official Facebook page of Mahmoud Abbas’ Presidential Guard posted a picture of the Western Wall with a Palestinian flag superimposed on it. Not a murmur of protest anywhere about the Arab claim to ownership of the holiest spot to Judaism. A documentary broadcast twice on official PA TV declared that the PA plans to destroy the Western Wall Plaza, Judaism’s ultra-scared prayer site frequented by millions of Jews, and replace it with residential projects. The PA TV documentary stated that Jews worshipping at the Western Wall were “sin and filth.” No foreign statesmen or journalists were bothered in the least. There’s more here than an unspeakable double standard. By any scale, ceaseless indoctrination of young impressionable minds is an antithesis to peace. Its effects are lasting and pernicious. The PA has promised repeatedly to clean up its act but in reality has done the diametrical opposite with absolute impunity. Clearly in the eyes of the international community Ramallah’s rulers are unassailable, which in itself constitutes an obvious disincentive to compromise. Concomitantly, the world seethes against housing construction in distinctly Jewish areas. It creates a hullabaloo against tenders and blueprints that are years away from implementation. It artificially creates a bugaboo of ever-magnifying proportions. Given this, can Israel remotely expect a fair hearing in the international arena or should it expect “delegitimization on steroids” no matter what it does? Yes, it is in the interest of both Muslims and Christians to delegitimize us as a Jewish State. Like the way they manipulated us into the release of cold blooded murderers; morally the Jewish State should not have done it. There is also something wrong with our leadership. We need to suspend the peace talks now and demand that the incitement stops. We need to start by proving the Jewish connection to this land by showing them that Islam stems from Judaism. In the Quran our Jewish prophets are “Muslims” because “Muslim” means submission and obedience to the one God, which is what the Jews did before Islam. Perhaps they need a history lesson to remind them how the Prophet Muhammad was influenced by the Jews of Medina and accepted the Jewish God and the Jewish prophets; that Islam was originally a movement within Judaism but it separated itself when the Jews of Medina did not accept the Arab version of Judaism; how, in his anger, the prophet altered the nature of the Sabbath and changed it to a Friday, how he stopped praying towards Jerusalem and changed the direction to Mecca and finally how he changed the fast to the entire month of Ramadan. We can certainly prove to them that the Dome of the Rock and the Al-Aqsa mosque were built upon Judaism’s holiest site, the Temple Mount in Jerusalem, because the pillars from the Jewish Temple still exist there. Similarly, the Ibrahimi Mosque in Hebron is built upon the Cave of the Patriarchs where Abraham and Sara, Isaac and Rebecca, and Jacob and Leah are buried in a cave that was purchased by Abraham to become the family tomb in a contract of sale recorded in the Torah in the Book of Genesis. Finally, it needs to be made clear that Palestine was never was an Arab entity and never belonged to the Arabs. Neither did the West Bank belong to the Arabs. If anything it is in the interest fo Christianity to assist in maintaing a strong Israel. It may be in the interest of certain secular forces but it certainly NOT in the interest of Christians to strengthen islam in way, shape, or form. Haven;t you heard what is happening to Christians throughout the islamic world. AS goes Israel so goes the Christian world in time … for that matter the secular world that hypocritically espouses personal freedom and human rights as their rallying call. Other than that I can’t anything to disagree with in your comment. I AGREE WITH YOU 100%! YOUR BOOK IS EXCELLENT! How does one negociate with people who refuse to recognise the historical Right of The Jewish People to THEIR HOMELAND?! This is an honest look at the “peace talks” and Kerry’s duplicity. Kerry is considered kind, courageous, a man of deep character and convictions. I have heard it from the bima, with mention of his partly Jewish background, that we should stand beside him in every way, because, what with the Middle East in turmoil, violent and unpredictable, and Israel’s very existence at stake, it is his unwavering desire for a just, lasting peace between Israel and the Palestinians, and unshakeable will to achieve it, that make Kerry Israel’s last, best hope for survival. That’s what they’re thinking in my neck of the woods, sad but true. Kerry is a stingy, cowardly man, of shallow character, with little or no conviction. He served on a SWIFT boat in Vietnam, with John O’Neill. Read O’Neill’s book, “Unfit for Command,” about Kerry’s actions in Vietnam. Those who think that Kerry has an “unwavering desire for a just, lasting peace between Israel and the Palestinians” are fooling themselves. Of course it can’t expect a fair hearing .. since when has anything about world response to Israel been fair? One of the most ethical countries in the world, that has contributed possibly more than any other country to world well-being, is ostracized and villified like no other. Enough crappy talks of peace .. none will be forthcoming, not this time nor any other, until PA stops educating their children to hate Israelis/Jews. Undoubtedly there will be “delegitimization on steroids” at a certain point in the not-too-distant future and the only thing we can do is stop being afraid of “world opinion” and start holding our heads high and do what we have to do without the second-guessing. Thank you for once again telling it like it is. But one comment. The western wall (kotel) is not the holiest place to Judaism. Its holiness derives from Har HaBayit, to which it’s a retaining wall. Because of its closeness to Har HaBayit and the place where the Beit HaMikdash (the Temple) stood before it was destroyed, it’s imbued with the holiness you mention, and with the Shechinah hovering near. The hate propaganda against Israel will continue…nothing new under the sun…. WHAT IS IMPORTANT is, that Israel will keep Judea and Samaria…the rest is PEANUTS ! CAN YOU HEAR ME KERRY ??????????????????????????????????????????????? I think, the world will not collapse if Israel announces that it will not accept one Palestinian refugee (neither the original one, nor the incrementals), nor it will move/demolish one Jewish home. On the contrary, from any point of view, such an announcement may have only a beneficial effect.